AUSTIN, TX--(Marketwire - September 22, 2010) - BreakingPoint, creator of the BreakingPoint Storm Cyber Tomography Machine (CTM)™, was today named a Due Diligence Finalist in the 2010 American Security Challenge. It is the only event in the nation devoted to bringing the latest and best security technologies to market for improving U.S. homeland security. The breakthrough BreakingPoint product was recognized for unleashing Internet-scale cyber war in a controlled environment to measure the resiliency -- performance, security, and stability -- of network and data center infrastructures, conduct repeatable experiments, and train cyber warriors. Powered by a patented innovation in network processors, a single BreakingPoint Storm CTM™ replaces a complex, multimillion-dollar cyber range with an easy-to-use, comprehensive, and low-maintenance solution that includes a scientific Resiliency Score™ methodology. While more than 220 cyber and physical security technologies were submitted for consideration, BreakingPoint was one of the few challengers invited to the semifinalist round. "The cost and complexity of building out cyber ranges, as well as the lack of a standardized methodology for measuring resiliency, stand in the way of securing our nation's critical infrastructure. It is an honor for BreakingPoint to be recognized as providing the comprehensive capabilities, high-performance technology, and scientific methodology required to address these urgent needs." The BreakingPoint Storm CTM is used by government agencies, defense contractors, enterprises, and service providers to harden networks and data centers to be resilient in the face of escalating application load and attack. A single BreakingPoint Storm CTM produces high-performance traffic from hundreds of real-world applications, load from millions of users, and comprehensive security coverage that includes thousands of current attacks and malware, as well as obfuscation and evasion techniques. 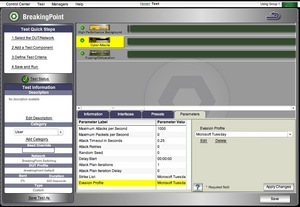 The product also features built-in automation for producing a standardized and repeatable BreakingPoint Resiliency Score, validating the accuracy and performance of Lawful Intercept and Data Loss Prevention systems, and measuring the performance of massive virtualized infrastructures in the face of peak user load and attack. Semifinalists will be showcased at the 2010 American Security Challenge event on September 23, 2010 and are eligible to receive any number of awards, including pilot programs sponsored by prospective customers. The American Security Challenge matches an estimated $25 million in contract awards, pilot programs sponsored by prospective customers. Under the auspices of the National Security Initiative, the Challenge increases the visibility of innovative technology and helps the commercialization process so that such technology can reach either the public or the commercial marketplace faster to protect our citizens and critical assets. BreakingPoint is the standard by which the world's governments, enterprises, and service providers measure and harden the resiliency of their network and data center infrastructures. BreakingPoint's patented network processor-driven architecture powers the world's first and only Cyber Tomography Machine (CTM) to expose previously impossible-to-detect stress fractures within network and data center infrastructure components before they are exploited to compromise customer data, corporate assets, brand reputation, and even national security. BreakingPoint was recently recognized by the 2010 American Security Challenge and 2010 Security Innovation Network™ (SINET) Awards for innovation in securing critical network infrastructures. For more information, visit www.breakingpoint.com. 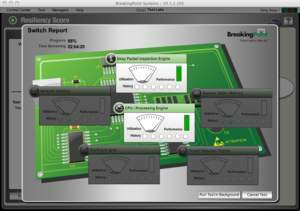 BreakingPoint Resiliency Score measures and hardens cybersecurity infrastructure. BreakingPoint Storm CTM recreates Internet-scale cyber war to measure and harden network and data center infrastructure. Recreating Internet-scale cyber war to measure and harden the resiliency of network and data center infrastructures.